Let us draw a comparison here on a widely discussed topic in the MLM sector – Unilevel vs Matrix Compensation Plan. Before getting into the subject, we shall deal with the basics of MLM or Network Marketing and how an MLM software helps in organizing the MLM business efficiently. A multi-level marketing business(MLM) or network marketing is a tiered, commission -based business. Here, sales associates not only sell the product themselves but if other other sales representatives join the company beneath a sales associate, the sales associates also earn a commission every sale the new sales representative makes! Thus, in MLM business there are two possible income streams: Their own sales, and a percent of the commission made from other sales representatives! What are MLM Business plans? MLM compensation plans decide when and how much commission should the independent distributors should be provided in a network. The various compensation plans in existence are Binary, Unilevel, Matrix, Hybrid, Generation MLM Plan, etc. Calculation of compensation and payouts become more complex when more members are added to the network. A perfect MLM software would definitely help you in dealing with all this smoothly. A Unilevel MLM Plan is one of the most popular MLM Plans in the world. In a uni-level plan, a distributor can typically sponsor as many agents as his frontline. The main advantage of Uni-level MLM Plan is that there is no limit on the number of distributors one can sponsor! The number of sponsors, the more is the commission. Also, all the sales distributors in the same level would receive the same compensation and make a note that it will be only paid out on a limited depth (can be up to 7 levels deep). Some also consider this as a disadvantage because it inhibits deep sales organizations. The Unilevel MLM compensation plan calculator allows you to calculate the commissions, returns etc. A Matrix MLM plan has mainly two parameters: width and depth. The width describes the number of frontline distributors that you can sponsor and the depth mentions the number level for which you will be compensated for. For example, a 3×8 Matrix MLM Structure will have only 3 distributors as his frontline and the commission will be paid for up to 8 levels. 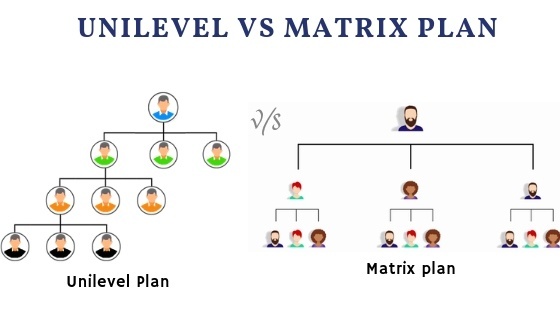 Matrix MLM plan is almost very similar to the Unilevel MLM plan. The only major difference is that in the forced matrix plan, each distributor can only sponsor a certain number of distributors as his frontline. And all the other distributors added, will be placed down under the other distributors. At the same time, in Unilevel MLM plan, each distributor can sponsor as many distributors as he likes and all these distributors will be on his frontline! Also explore the Matrix MLM compensation plan calculator online. Pay: Matrix MLM Plan pays more in comparison to the Unilevel MLM Plan. 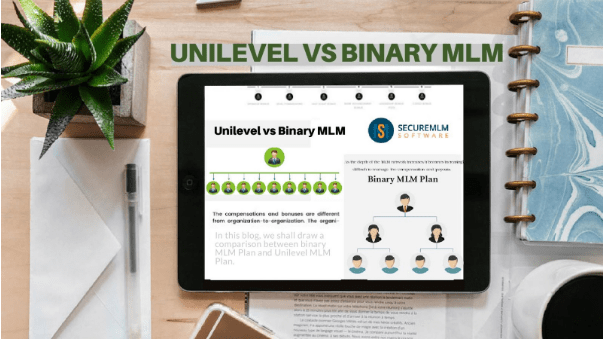 Implementation: Since the Unilevel MLM plan involves the uni-level distribution of members, implementation is quite easier than the Matrix MLM plan. Downline expansion: Downline expansion is easier in case of a Unilevel MLM plan due to the uni-level layout. Downline structure: The down line structure of the Unilevel MLM plan is different to that of Matrix MLM plan. Matrix MLM plan consists of multiple legs in which members are placed according to the parameters (width and height). Downline Matching: Downline matching is not essential in case of Unilevel MLM plan whereas it is essential in the case of Matrix MLM plan. Downline recruitment: In case of Unilevel MLM plan, a sponsor cannot influence the downline recruitment since the concept is that of uni-level. Since the Matrix MLM plan has the concept of spillover, a sponsor can influence the downline recruitment to an extent. Teamwork: Matrix MLM Plan depends on the entire network while this does not influence the Unilevel MLM Plan. Unilevel MLM Plan and Matrix MLM Plan have its own advantages and disadvantages. It is up to the MLM firm to decide on which plan suits them the most! Read in detail about the comparison of Unilevel Versus Binary Compensation plan. Planning to build an MLM software to manage your MLM business? Try out a free MLM Software Demo to understand deeply about the working of the software.